Becker Mining South Africa has extended its range of safety and communications systems to include a new atmospheric and environmental monitoring system, designed for use in industries where the presence of gases may pose a safety or health risk for employees and the environment. The high accuracy Becker Varis Smartsense gas monitoring system, which meets stringent quality, safety and environmental specifications, enhances safety in diverse sectors. Adherence to Intrinsically Safe (IS) certification means this system can be safely deployed in hazardous and potentially explosive areas. Environments which require dependable atmospheric and environmental monitoring include general industry and manufacturing facilities, petrochemical, oil and gas plants and the mines. Apart from the accurate detection and monitoring of ambient temperature, humidity and barometric pressure, every device can monitor up to four gases, including oxygen, methane, carbon dioxide, carbon monoxide, hydrogen sulphide, chlorine, hydrogen and nitrogen dioxide. The Smartsense unit can be fitted with different gas monitoring heads to suit specific environmental monitoring needs. An important advantage of the Smartsense device over conventional monitoring systems is that all features are integrated into one compact device. There is no need for complex cable connections, troublesome programming or difficult calibration. Additional analog/digital input ports provide compatibility with other devices to accommodate a plant’s expansion requirements. Smartsense gas monitors/controllers allow for localised use or for implementation into a system-wide installation using industry standard communication protocols such as Modbus RTU and OPC connectivity or for integration into legacy systems using 4-20 mA. This hybrid system is customisable to all installation requirements, including copper (RS-485/Ethernet) Radio Frequency (UHF – VHF data radio / Wi-Fi) and fibre optics data connectivity. There are various graphical representation methods to display data, including the Becker Mining Systems application for smartphones, or integration into existing scada systems. Web-based remote viewing of an entire environmental monitoring system is made possible through an OPC interface over a customer’s existing LAN network. The Smartsense fixed monitor has three fully programmable alarm set points for alarm and output controls, with a short-term exposure limit (STEL) and time weighted average (TWA) limits, displayed on a large LCD screen. It is possible to view the reading from up to five metres away. 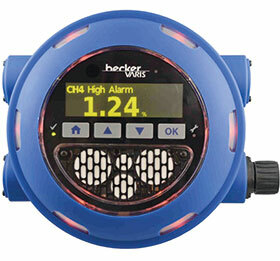 An adjustable backlight makes this device suitable for both underground and above ground applications. This system, with low power consumption, has an Index Protection IP67 rating for protection against the ingress of dust and liquids. The Smartsense system, with its integrated controller functions, operates as a ‘black box’ and stores critical information, which could be vital in a post-accident investigation. Stored information includes the calibration record, alarm history and data logging. The watchdog feature alerts the user/maintenance team of any system errors, for example, if the system has detected inaccurate measurements or calibration errors. This information is communicated both locally through the maintenance LED and remotely on the supervisory platform. Preventative maintenance of this low maintenance system requires simple procedures – between monthly and quarterly – to ensure optimum performance and extended service life. It is important that sensor intake areas are kept clean, with no obstructions. The device is supplied with three types of mounting brackets for easy installation – panel, roof bolt or cable mounting. Becker Mining South Africa’s commitment to providing a critical service to local industry encompasses the design and manufacture of products and systems using the latest technology. Plant safety is significantly enhanced by the implementation of one, or a combination of Becker’s specialised multi-technological energy distribution, automation and communication solutions. The Becker Varis Smartsense, which is able to monitor up to four different gases, also has integrated features for the detection of ambient temperature, humidity and barometric pressure. This easy to configure system has a patent pending on a 360 alarm function for reliable visual alarm visibility. Utilities offer enormous potential for liquid analysis measuring technology.